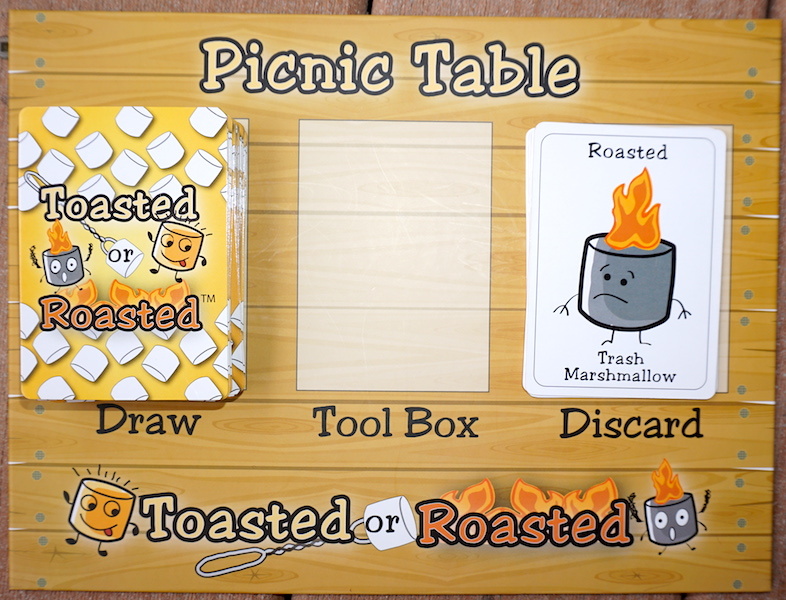 Toasted or Roasted is a simple draw-and-discard card game, designed by Jeff Johnston (Pair of Jacks Games) and published by Education Outdoors. Packaged in a waterproof zip-top bag, it’s perfect for a camping trip. A turn of Toasted or Roasted is simple: draw a card and then either play or discard a card. Each player starts off with a hand of cards and two disc-shaped cards on the table: Firewood and a Toasting Stick. 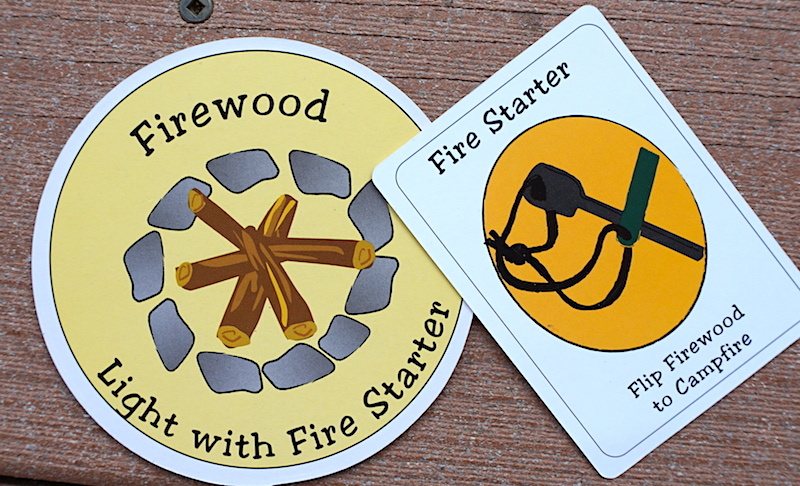 The first card they must play is a Fire Starter, which allows the player to flip their Firewood card. Now they have a Campfire! Once the fire is going, the next card players will want to play on their fire is a Marshmallow card. On the next turn, they may replace the raw Marshmallow with a Toasted card. In the meantime, other players could play a Rain card to turn a Campfire back into Firewood, or a Roasted card that forcibly discards the Marshmallow. Players get an additional advantage once they’ve successfully “toasted” a marshmallow: they may flip over their Toasting Stick to reveal a Toasting Fork. This allows them to play two raw Marshmallows in a single turn. The Toasting Fork speeds up the game by increasing hand turnover, but only one Toasted card may be played per turn. Multiple Marshmallow cards increases the chance that a Marshmallow will survive until your next turn, but also the chance that an opponent will play a Roasted card to slow you down. Special note: There is a rule specific to Fire Starters. Since they are necessary for starting a Campfire, but otherwise useless, they may be discarded to a special area called the Tool Box. This allows players who need a Fire Starter to pick one up, but if they do so, their turn immediately ends and they must wait until the next turn to play it. The first player to successfully “toast” 3 marshmallows wins. In our experience, it’s usually a close game at the end, with multiple players trying to toast their 3rd marshmallow in the same round. Gameplay is a balance between building your own points and delaying other players’ victory. Although it has a “take-that” feel, it usually stays light-hearted, and needing only 3 Toasted cards to win keeps the game from dragging on too long. Toasted or Roasted is cute, simple, and fun. There’s not a lot of strategy involved, but that also makes it easy to teach and easy for young kids to play. Even struggling readers can follow the clearly illustrated cards. 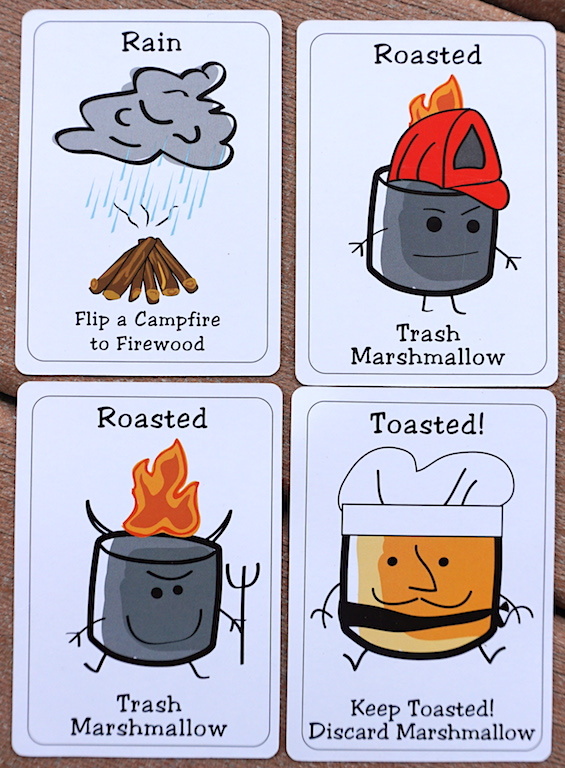 Speaking of illustrations, we love the humor value in the Toasted and Roasted cards. Each one has its own personality, which adds some visual interest to the game. Although Toasted or Roasted requires cards to be played in a specific order, it avoids the pitfalls of a purely deterministic game like Cootie. By minimizing the types of cards used, and keeping the distribution appropriate (e.g. fewer Roasted cards than Fire Starters), no one goes more than a turn or two without being able to play something. We found that the ease of play, heavy-duty components, and quick play time made this a great game to take camping. Our kids requested it several times on our recent trip, and it doesn’t only appeal to kids. Teenagers saw our kids playing and asked if they could join in, too. It’s not our favorite game, but it will definitely be included in all future camping trips! Buy Toasted or Roasted from Amazon or try your local camping supply store. 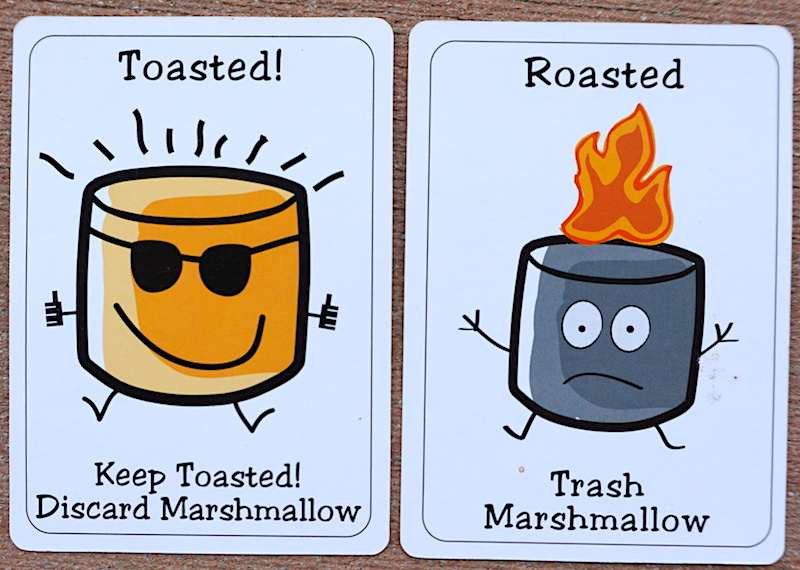 Education Outdoors provided The Family Gamers with a review copy of Toasted or Roasted.